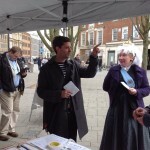 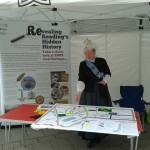 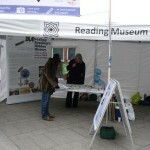 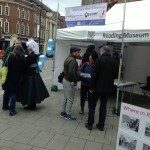 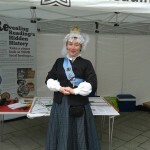 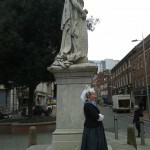 Queen Victoria and visitors discussing the best and worst in Reading to help make trails for smartphones/tablets at the iOpener event Town Hall Square 21 March 2015…………………..
Data capture – photographing the good/bad counters on our tablecloth map……………….. 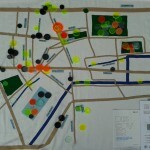 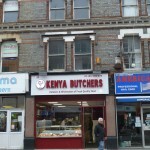 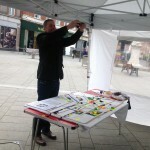 Placing counters on the tablecloth map iOpener Town Hall Sq 14/3/15………………………………………………. 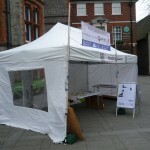 iOpener marquee, banner, tablecloth map & 5 icons trail near St Laurence’s 14/3/15………………………………………………………. 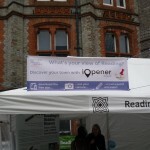 It pays to look up in Reading. 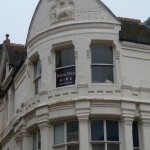 The old Bull Hotel sign above Moss.